This "Historically Speaking" column was published in the Exeter News-Letter on Friday, February 15, 2019. In 1910, Boston Globe sports writer Melville E. Webb Jr. declared that the old winter sports of “shinny on the ice” and ice polo “at last may be said to have been surplanted (sic) as New England’s keenest out-of-door winter sport by Canadian Hockey. The game has been slow to come, the older ones tenacious in their hold on New England youth, but at last hockey’s foothold has become secure, and this winter of 1910 finds it supreme.” Shinny and ice polo were less organized – the same way stick ball is a less organized form of baseball. Hockey, adapted to rink play, had been growing in popularity in Montreal since the mid-1870s. It was picked up in New England by some eager skaters at Yale. Exeter, with its many frozen rivers and streams, was well-suited to ice sports and yet, we have very little in the collections of the Exeter Historical Society relating to hockey. Several months ago, we received an email from Mark Allred, a hockey writer, researching the great Fuzzy Thurston. He directed us to a website called “New Hampshire Legends of Hockey” and asked if we had any information on Fuzzy’s early life. At the time, we did not. The only thing we had in our files was an article from the Exeter News-Letter published in 1981 entitled, “The Thurstons – A Family Affair in Hockey.” Some sleuthing has filled in some of the details of his life. In 1903, George and Ellen Thurston welcomed their ninth child, a boy, who they named George Herbert Thurston Jr. They lived on the Exeter River near Great Bridge. The elder George Thurston worked as a mason – hard, heavy work. Ellen presided over a large ever-growing family. Between 1889 and 1912, she would bear 14 children, of which 10 would survive to adulthood. The family moved to River Street extension when George was still in elementary school. The move put him closer to the Exeter River and in winter he must have watched – and joined in – as the Academy boys skated and played loose games of hockey. Unlike most boys of working-class parents, George graduated from high school. The Exeter News-Letter lists him as one of the 12 boys in the Tuck High School class of 1920. On Class Day, as his schoolmates presented the class history, class oration, address to undergraduates, class prophecy and class will, G. Herbert Thurston read a piece from “The Whiz Bang, Vol. III, No. 10.” This only makes him more endearing, as Captain Billy’s Whiz Bang was a notorious off-color magazine similar to Mad Magazine. After graduation, he became a mason like his father. He wasn’t a big man – only about 5feet 5 inches tall, but he was strong, stocky and never lost his love of hockey. During the 1920s, ice hockey was a game for both college boys and working men. Amateur leagues sprang up everywhere. In 1922, Thurston, known as “Fuzzy”, was playing with the Exeter Hockey Club. He continued to play in various leagues around New England, including the Amesbury Maples and as far away as the Bronx Bombers. The greatest adventure of his life took place in 1932. He was nearly 29 that winter, too old really for the Olympic team. Instead, Thurston was chosen for a European tour. The Boston Globe reported, “A group of amateur players, well known about Greater Boston, will sail for Europe Friday morning on the S.S. Majestic, bound for a long tour of the continent and the British Isles where they will play at least 20 games as well as compete at the European amateur championships in March. Walter Brown’s team of 'All Stars' will comprise 10 players most of whom have been playing with the local clubs this winter. The team will be away from home six weeks at least and will play in 14 cities in nine different countries.” Organized under the auspices of the French Ice Hockey Federation, the tour overlapped with the 1932 Olympics, which were being held in Lake Placid, New York. Walter Brown, it should be noted, was a Phillips Exeter alumnus who would later go on to be the founder and owner of a little Boston basketball team called the Celtics. Europe was going through an unsettling time in 1932. The Depression was hitting hard and the politics of the day were becoming angry and divisive. Germany was beginning its descent into Nazism. It was while in Germany that Fuzzy brought back a souvenir. In 1981, he related the following story to the Exeter News-Letter: “It was the early 30s and Hitler had just come to power in Germany. The Olympics were playing an exhibition against the German national team. After the game, as Hitler looked on, the German captain, out of respect for Fuzzy wanted the baseball cap that George always wore when he played hockey. He agreed to give it to the German in exchange for a patch the German wore.” Sadly, the patch was later lost. Thurston returned from the trip with a solid playing record. He continued to work as a mason while playing for various clubs. He coached youth hockey in Exeter and coached at UNH. The New Hampshire Legends of Hockey website tells us that he played for the Amesbury Maples until 1969, “playing his last game at the age of 66 at the Phillips Exeter Academy rinks and getting named MVP.” If Exeter had its own athletic Hall of Fame, George “Fuzzy” Thurston would be an honored member. Note: there is another famous “Fuzzy Thurston,” Fred C. Thurston, who played football for the Colts and the Green Bay Packers. One can only wonder what Exeter’s Fuzzy Thurston felt about his football counterpart. 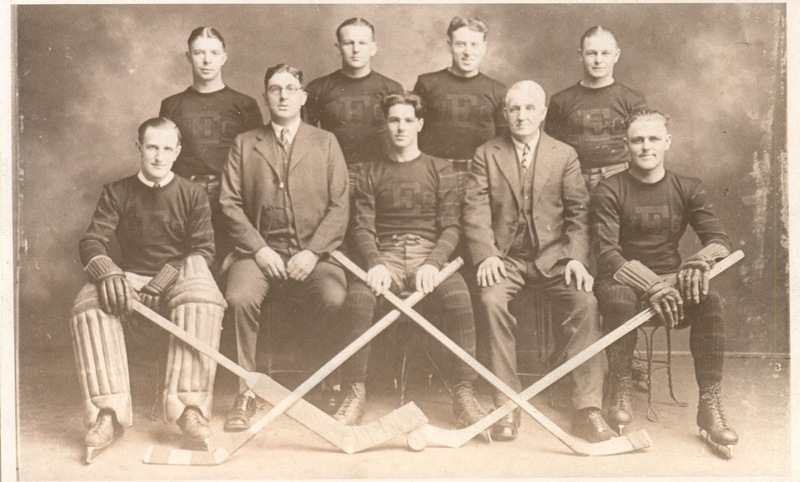 Image: The Exeter Hockey Club around 1922. 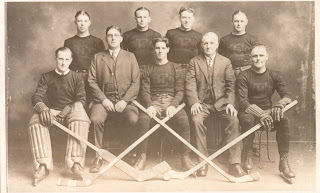 Front row (L – R), Philip “Pep” Russell, goalie; Carl Myers, assistant manager; William Stocks, right wing; James Nolan, manager, and Dean Holmer, right defense. Rear: Wilber Booth, left defense; Victor Connor, utility; Harlan Williams, left wing, and “Fuzzy” Thurston, center.